A review in 10 words (or thereabouts): Sometimes it's not so bad to lose your head. The in between part is still a little fuzzy, but he can tell you that, at some point or another, his head got chopped off and shoved into a freezer in Denver, Colorado. Five years later, it was reattached to some other guy's body, and well, here he is. Despite all logic, he's still 16 and everything and everyone around him has changed. That includes his bedroom, his parents, his best friend, and his girlfriend. Or maybe she's not his girlfriend anymore? That's a bit fuzzy too. Looks like if the new Travis and the old Travis are ever going to find a way to exist together, then there are going to be a few more scars. Oh well, you only live twice. I was a bit apprehensive about this particular book. Not that many years ago I checked out Where Things Come Back by John Corey Whaley. It was getting rave reviews. It had won the Michael L. Printz Award for exceptional literature written for teens. It was relatively short. So I checked it out and almost immediately felt like an idiot. This author was trying to tell me something. It was something important, but for the life of me, I couldn't figure out what it was. Have you every experienced that? Knowing there's something deep waiting just under the surface, something profound, but you have no idea what it is? You feel a bit ridiculous, but unless someone else is willing to read it and discuss it with you, there's not a lot you can do. That type of thing has always eluded me. I wasn't one to see the symbolism in Shakespearean sonnets. I could never really decipher the true meaning of poetry. I, Emily, am a literal reader. 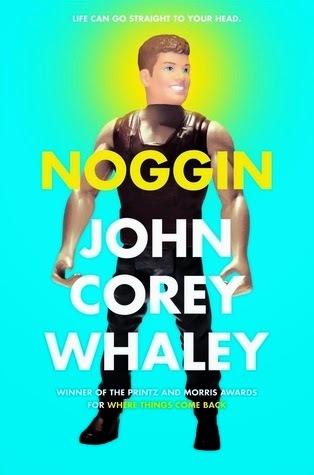 So, yes, I was a bit hesitant to pick up another John Corey Whaley story. But Noggin is different. Still profound. Still well written and interesting, but far from intimidating and much more relatable. Travis Coates is going to die. His hail mary, a decision to have his head cut off in the hopes that one day science will be able to successfully reattach it to a healthy body. Science, in Whaley's world, works pretty quickly, and only five short years later (or long...depending on who you are), Travis is living a second life, still sixteen, still in high school, but very much alive. Except that he can't seem to move on. Five years for Travis was the length of a nap, but the world kept moving without him. I liked Travis. He was a pretty good guy before and after. He loved his friends, was grateful for his family, and faced death with grace and courage. Travis after was still strong and determined afterwards, and though he faced some obstacles, he met this second chance with a respectable amount of enthusiasm and appreciation. But here's what I don't get...you have a boy who, for all intents and purposes, has died. This same boy has returned from the dead, is attached to a strangers body, and after only a couple of weeks, has returned to his life. Um...shouldn't someone like that be talking to someone? Shouldn't the family be seeking counseling? Should the kid have some time to adjust? Talk about life after death? Life five years later, when, for him, it has only be a couple of days? I know that would make for a terribly book because all of the conflict comes from this choice to throw him into the deep end, but this seems like a horrible plan. Much like the way a family, who's son has been missing for years, sends him to school after a weekend in Dead to You. Overall a pretty good book filled with caring, compassionate, flawed characters who are facing the unique opportunity of second chances...chances to grow, and love, and become the people they want to be.